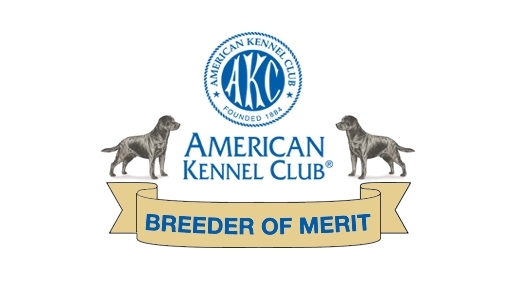 We have two litters of Labrador puppies planned for 2019. We’ll be breeding the first litter this summer – probably due around the end of August – and we’re expecting both blacks and chocolates. The father is a Master Hunter with several field trial ribbons and an Amateur win. 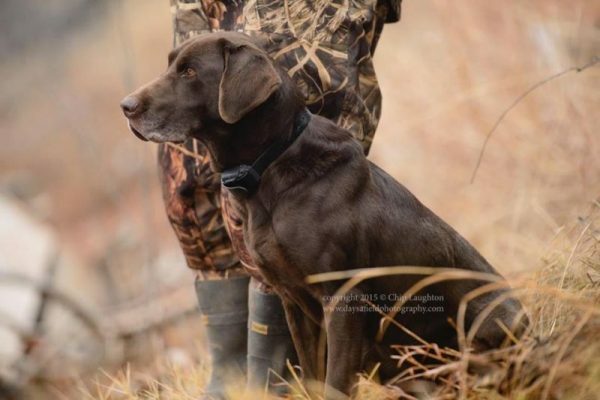 And he’s still out duck hunting at 10 years old. Bleu’s grandmother and grandfather were both sired by Way-Da-Go Rocky, a dog who played a big part in our early Labs. I also noticed a similar look between Bleu’s family and some of my dogs. They’re nice to look at – more like Labradors before the breed split into show or field lines. And did I mention he’s chocolate? Yum. The mother of the litter is our Wynk. She is a moderate style of Labrador. I’d say she falls in the middle between the show and the field style and would be recognized as a Labrador just about anywhere. When she was a youngster I took her with me to a hunt test where I was running her mother. Wynk told me she wanted to run too – “Put me in coach. I’m ready to play!” So I did and she smoked it! She’s very sweet and is great with children and puppies. She’s also great in the house. 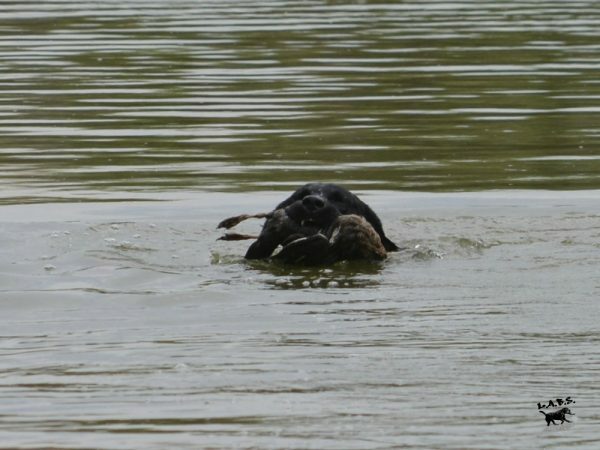 Combine her personality and her size (65 lbs) with her love of retrieving birds and she’s just about the perfect Labrador. Because of Bleu’s Louisiana connection, we’ve christened this the “Cajun” litter. The puppies will be raised in our home. They will have the broad head and balanced structure as described in the standard, moderate size and plenty of retrieving desire with a willingness to please. They could do well in a variety of venues such as hunting, hunt tests, obedience, agility, rally and as treasured family dogs. Nice, easy-to-look-at dogs with drive, confidence, marking ability and an off-switch. They come with Early Neurological Stimulation, well socialized, vet checked with first vaccinations, dewormed, microchipped, AKC registration and a 26 month health guarantee. Both parents are OFA hips and elbows, plus clear of EIC and CNM. The puppies will be able to go home in the fall. The second litter will be able to go home around Thanksgiving and will be all black. We’ll post more information once we’ve firmed up our plans. For puppy inquiries, please use our contact form or fill out our Puppy Questionnaire. 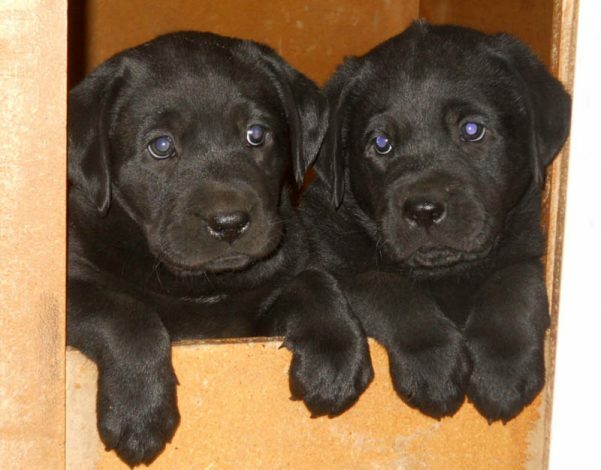 You can also read more from some of the owners of Justamere Ranch Labrador Retriever puppies.